I felt at home in the 6000 year old Hal Saflieni Hypogeum, Paola, Malta. The shapes were familiar, I had seen them in Rothko. 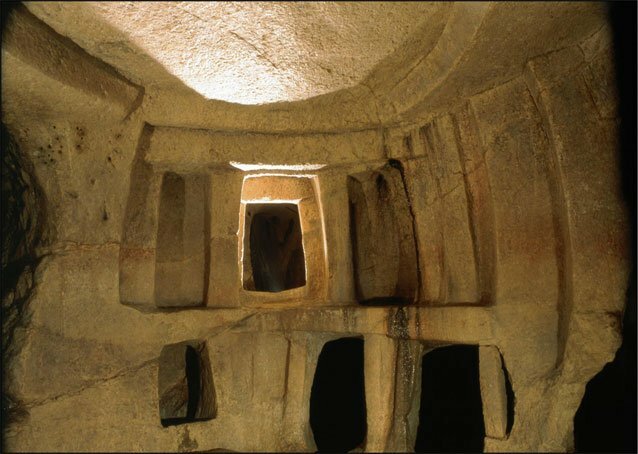 These mysterious underground chambers, majestic burial places, were excavated by hand using tools of antler and flint, the limestone smooth as silk. Their perfect proportions of aperture and lintel thickness struck me as timeless. These softly lit caverns awed us to silence. In our mind’s eyes, we heard the scrape of flint on stone, the drip of rainwater in winter, the quiet conversation of the workmen eons ago. In a museum in Valletta we saw some offerings to the dead taken from these chambers. A tiny sleeping woman, fashioned from stone, her winter skirt of sheepskin-like stone gently crinkled at its hem, her best skirt. Such humanity touches us across the millennia. Move forward to the 20th century, and Rothko. His Red on Maroon could overwhelm you. Those huge vertical columns and apertures look like windows or doors, the sombre tones shift as you gaze at them, making you feel uneasy. But there is nothing there. Maroon by Maciek Pysz on his album Insight was inspired by this same Rothko. It’s contemplative, and unlike the other compositions on this album, this one is not sunlit, it is permeated by loss and reflective sadness. As I stood in one of the chambers of the Hypogeum I heard Asaf Sirkis’s gentle udu drum, it could have been the patter of rainwater, or a drum from 6000 years ago. Yuri Goloubev’s delicate bass playing could just as easily have been inspired by the painting or the need to ease our passage from life to the afterlife as I experienced in those cool chambers. All too soon, we were in a sunlit street, wondering if we had imagined all that was beneath our feet, marvelling that such beauty could have been visualised by our ancestors and then made to happen.